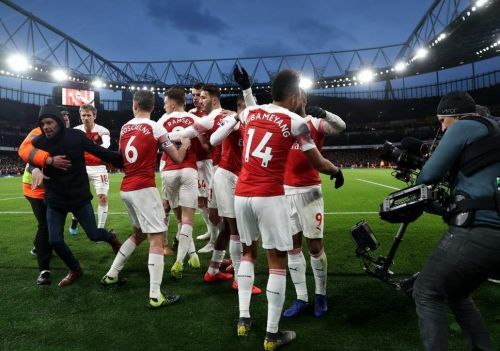 Ole Gunnar Solskjaer’s incredible unbeaten run with Manchester United in the Premier League came to a sour end as Unai Emery’s Arsenal trumped them at home with a convincing 2-0 margin. A goal in the first half by Granit Xhaka was seconded by Pierre-Emerick Aubameyang’s safe spot-kick in the 69th minute. In return, United failed to trouble the scorers as they missed some very promising opportunities to cut down Arsenal’s lead in both halves of the game. Paul Pogba returned in the starting XI for United and the rest of the lineup remained majorly similar. Meanwhile, both Aaron Ramsey and Mesut Ozil played for Arsenal. The German filled in the gaping hole behind the two strikers, whilst Ramsey played as the box-to-box midfielder in the 3-4-1-2 formation. Here, we discuss the numerous sub-plots from the game and analyze certain crucial moments throughout the course of the ninety minutes. Right from when the first whistle blew, Arsenal’s intensity was one to be admired by the masses. They ran behind every loose ball, moved the ball to the flanks were quickly and used their pace to excellent effect from the wider areas. Ozil moved around the forward line and regularly searched for spaces whilst looking out for passes out of nowhere. Sead Kolasinac and Ramsey ran tirelessly on either side of the pitch to maintain their initial burst of insane intensity. They did not allow United establish their stronghold over the proceedings by recovering possession, playing some tricky passes between the lines and constantly troubling United’s backline. 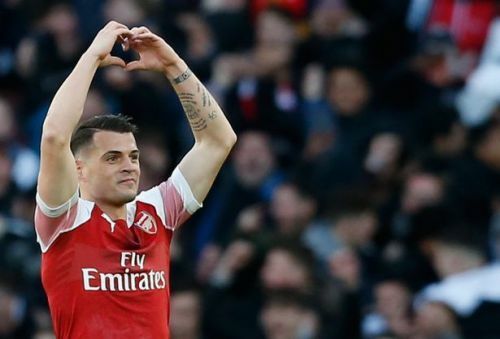 On one such occasion, Xhaka received a pass that he shifted to his preferred left foot and took a powerful shot on the empty side of the net. United made two mistakes here. Firstly, Fred failed to close down Xhaka’s shot and allowed him too much space to attempt a shot. Secondly, David de Gea misjudged his presumption of the direction of the shot, thus shifting to his left, thereby barely making it to the actual position of the shot. Arsenal, therefore gained a deserved early lead against their opposition. Ole has brought in the tendency to start games on a positive note, something that was missing from their style of play prior to the Norwegian’s appointment. However, today was an off day from that perspective.